Mastering the best apple pie isn’t just about the recipe, it also has a great deal to do with technique and a little to do with baking science! 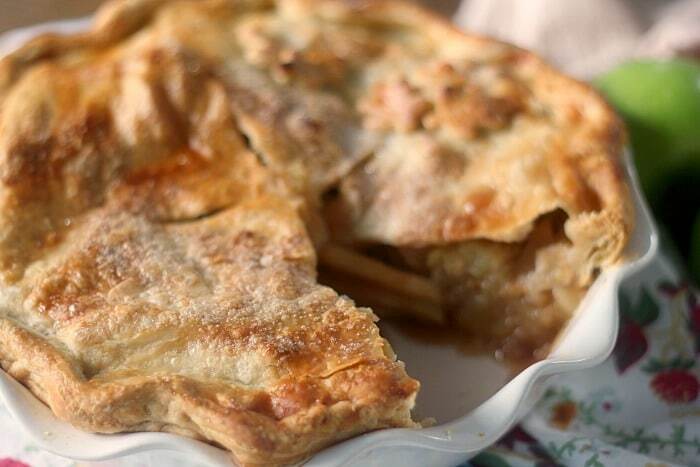 Learn all of the ins and outs of how to create the best apple pie from scratch! There are endless apple pie recipes available on the web and the world doesn’t need another one. But what the world might need is a very detailed look at apple pie execution and a guide to mastering it. I have made apple pie after apple pie in the last few weeks in order to prepare for this article. I have read numerous apple pie recipes and tips and consulted all of the experts I could think of. And today, I am here to challenge you to Master the Best Apple Pie as the October Mastering Challenge! Now you might be thinking to yourself, “Doesn’t the best apple pie start with the apples?”. The answer is no, it does not. Pie crust is absolute key to good apple pie, or any pie really. Yes, the apples are extremely important, and we will get there, but the crust is what we are mastering first. In my journey to mastering the best apple pie, I got a little side tracked with crust. I hadn’t considered how vast the topic was until I started writing about it for the pie and realized it needed its own article dedicated to it. 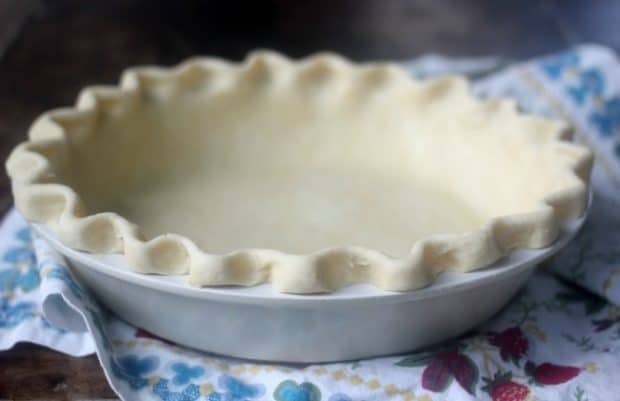 If you are a little shaky with your pie crust making skills, I highly suggest heading over to my Complete Guide for How to Make Pie Crust. I guarantee it will increase your crust making confidence and set you up thoroughly for making this pie! The kind of pie I’m teaching you how to make is an American Apple Pie, meaning it is the kind that is covered by a top crust. The other common kind of apple pie is called Dutch Apple Pie which has a streusel crust. I am a much bigger fan of American Apple Pie over Dutch Apple Pie. Streusel is very sweet and I think it takes away from the star of the show, the apples. A good, flaky and slightly salty pastry is the perfect complement to that sweet and tangy apple filling! The double crust for this pie is all about the flakiness! You want to be very gentle when working with your crust to avoid creating a tough pastry. This will give you the perfect structure for the filling of your apple pie. The best apple pie crust, in my opinion, is a slightly salty crust with mostly butter and a little bit of shortening for extra flakiness. The butter helps the crust literally melt in your mouth and the saltiness balances out the sweetness of the filling. Watch the video below to see exactly how to make the perfect pie crust. 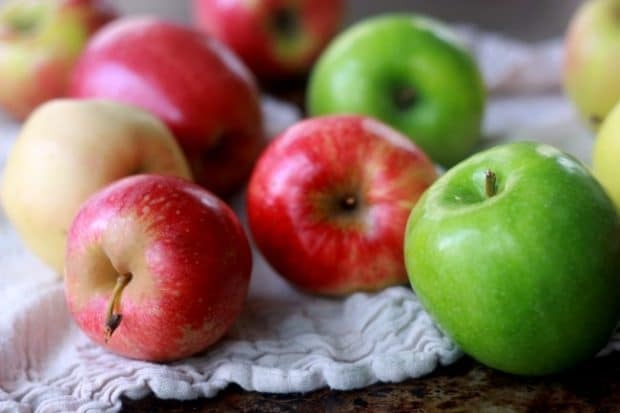 With seemingly endless varieties of apples to choose from, it is important to note that not all apples work well for apple pie. In fact many apples do not do well once heat is applied to them and actually start to loose their apple flavor. In preparation for this recipe, I actually took a day to test a wide variety of apples to see how well they worked for apple pie filling. To see my apple testing results, check out my Best Apples for Apple Pie article. But it is one of my firm beliefs that what makes something “the best” or “perfect” has mostly to do with personal preference. Some people believe that apple pie should only be made with apples that hold their shape very well, while others actually prefer a very soft apple filling. I personally like a bit of a mix. I lean heavier on the apples that hold their shape, and throw in a few that are a bit softer but have a strong apple flavor, like McIntosh, to give some contrast. I suggest thinking about what perfect apple pie tastes like to you. Is it very tart, or very sweet, or balanced between the two? Do you only want very firm apples, do you like a soft filling, or do you like a bit of a mix of texture? Use the varieties below to pick out a mix for your pie. 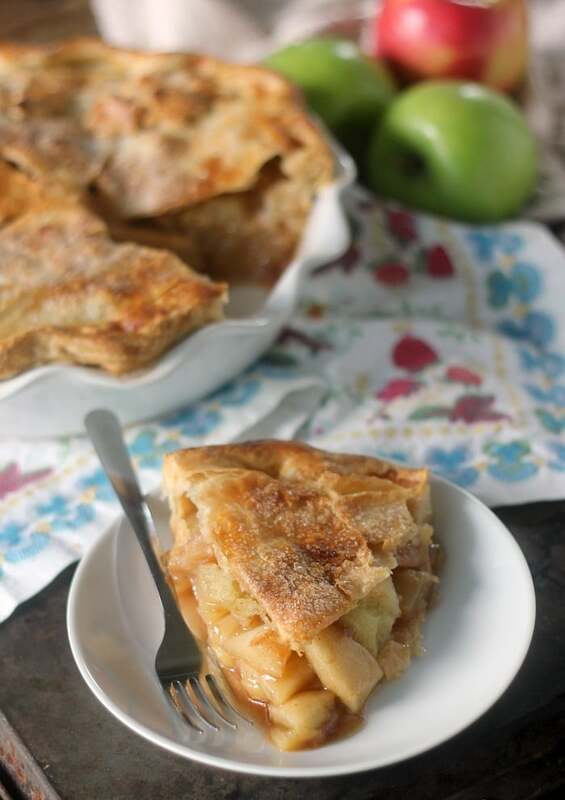 I personally love a pie filling that is more on the tart side with a strong apple flavor. My favorite combination is Granny Smith, Honeycrisp, and McIntosh. Granny Smith and Honeycrisp hold their shape well and are both tart, though the Honeycrisps balance out the Grannys tartness a bit. And McIntosh brings the most incredibly intense apple flavor with hints of cider. It also gets much softer than the other two and adds a texture contrast that I enjoy. 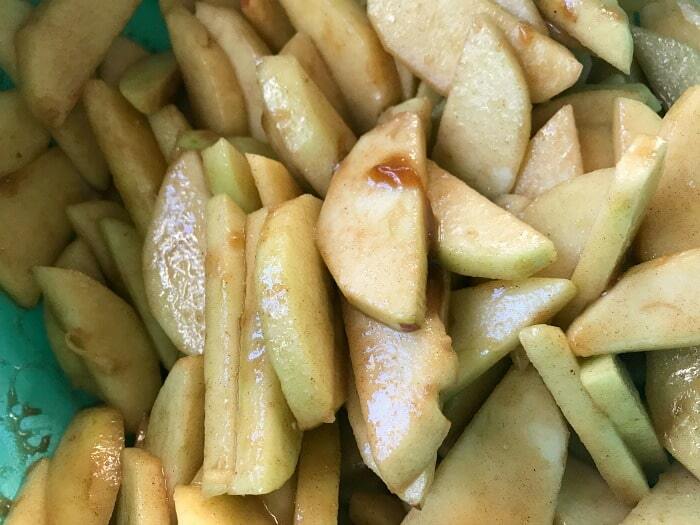 Once you have chosen your apples based on your preferences for sweet, tart, firm, and tender, it is time to combine them with your other apple pie filling ingredients. Again, creating your very best apple pie depends greatly on your preferences. I love a stronger molasses flavor with my apples so I always opt to use dark brown sugar. But if you prefer a more subtle molasses flavor, you can stick with light brown sugar. In my opinion, the only must have spice in apple pie is cinnamon. The rest of the spices are up to you! My favorite combination is cinnamon and cardamom! I add just about 1/8 tsp cardamom to my filling and it is such a wonderful compliment to the cinnamon and gives it a really nice depth of flavor. If you like a more traditional apple pie flavor, you can also use allspice, nutmeg, and cloves. I highly recommend not overdoing spices in apple pie. If you have picked out a good variety of apples that meet your expectations for what the best apple pie should taste like, then let them shine! 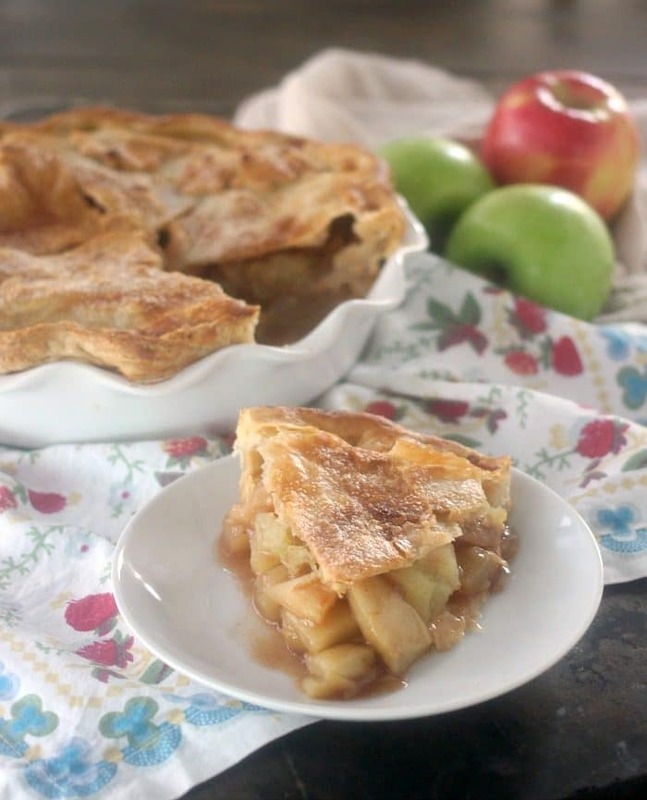 One of the dreaded challenges of making apple pie, or any double crust pie, is how to prevent the filling from shrinking so much that there is a large gap between the crust and the filling once baked. Most of the challenges with the pie gap occur due to the type of apple used. Some of the best apples for pie do shrink quite a bit in the oven, while others tend to hold their shape more. One of my very favorite pie apples, McIntosh, shrinks a great deal in the oven, but I don’t want that to be a reason not to use it in my pie! Here are some tips for preventing the pie gap. In all of my apple pie research, I looked to many experts for their knowledge so that I could truly master this skill. One of my favorite lessons I learned was from Rose Levy Beranbaum. In her apple pie recipe, she instructs you to combine the apples with the sugar so that they will release their juices before they go into the crust. This liquid is then cooked down to thicken and added back to the apples before filling the pie. The apples shrink as they release their juices so this is a way to jump start that process so they don’t shrink quite as much once they hit the oven. I highly recommend this technique! Baking Science Fact: Sugar is hygroscopic, meaning it pulls in moisture. When sugar is mixed with fruit, it absorbs the moisture on the outside of the fruit and in return the fruit releases the moisture it is holding inside through the process of osmosis. If you have opted for apples that will become soft in the filling, this means they will shrink more and you might need to really pay attention to the pie gap. One of the ways you can help this is to intentionally make your top crust shrink some. If you have studied my Complete Guide for How to Make Pie Crust, then you know that a crust with butter will shrink more than a crust with lard or shortening. BUT the shrinking of the butter crust will work in your favor for the top crust to help reduce that pie gap! Butter has a lower melting point, about 90F, compared to lard and shortening and therefore it will melt faster in the oven and cause the crust to shrink slightly. 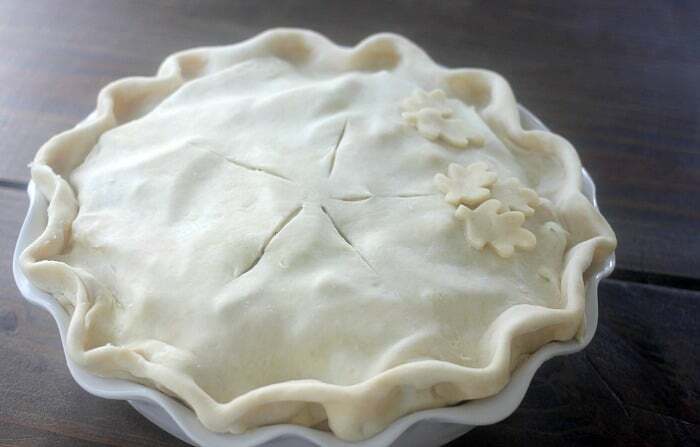 This would help a pie with apples that do not hold their shape well because the crust will more easily follow the shape of the filling. 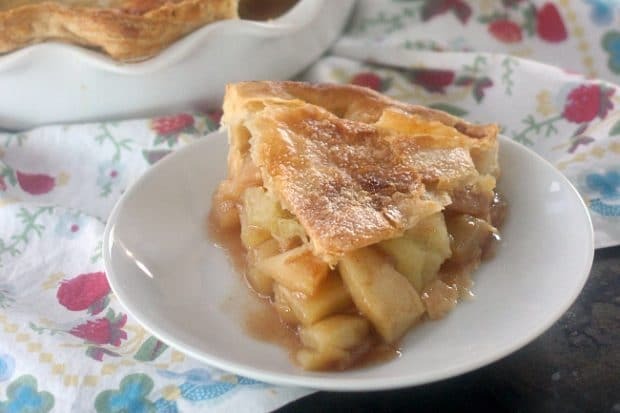 In addition to the pie crust that uses butter, if you are using apples that become soft in the oven, then it also might be beneficial for you to pull the crust a little tighter over your filling. Don’t do this too aggressively, but applying a little tension to the top crust when you are covering the filling will cause the gluten strands to retract in the oven and allow the top crust to shrink some. The reasoning for cutting slits in the top of your pie crust is not merely for the purpose of letting out steam so the crust doesn’t pop open. It also allows the crust to have some ability to move with the filling instead of just puffing up into a dome. Nothing would be worse with your apple pie endeavor than going through all the trouble of making one, only to cut into it and discover a soggy crust! So let’s review how to prevent a soggy crust with your apple pie, shall we?! The process of macerating the apples with the sugar, as explained above, is also part of the process of preventing a soggy crust. This process draws out most of the moisture the apple will release and then the juices are thickened. This will set the crust up for success to not become soggy. This is another one of Rose Levy Beranbaum’s tips. You want to position your oven rack on the very bottom position of your oven and place either a sheet pan or a baking stone inside to preheat with the oven. You want your oven and the baking surface to preheat for at least 45 minutes. This can be happening while you are preparing your pie ingredients. When you put the pie directly onto the hot surface, the bottom of the crust, which will take the longest to cook, will immediately start cooking. The bottom position of the oven will also keep the bottom of the crust in closer contact to the heat source. Here’s where the real secret lies with preventing a soggy crust: you need to bake it longer! A fruit pie can take a long time to bake, and to make sure the crust is really done on the bottom, it needs much longer than you might think. If in doubt, leave it in the oven. Apple pie, with it’s jam-like filling, can stand up to a very long baking time. If you are a new pie baker and still don’t quite have the feel for when your pie might be done, I highly suggest baking your pie in a glass pie plate. This way you can peek underneath it when you pull it out to see if it is done. If you are unsure, err on the side of longer. I promise, it is really hard to completely ruin an apple pie by leaving it in too long. Cover the top crust with a piece of foil if it is getting too dark. I hope you now feel equipped to Master your very best apple pie! I just know you can do this! And definitely check out the other recipes in the Mastering Series and challenge yourself to master them all! Follow this detailed recipe to make the very best apple pie from scratch. This recipe details all of the techniques needed to master the perfect apple pie! NOTE: I highly recommend reading this recipe in it's entirety several times before starting the pie. There are multiple moving parts and it will set you up for success to have a full understanding of the recipe! In a large mixing bowl, whisk together the flour and salt. Add the shortening to the bowl and use a pastry cutter or a fork to cut the fat through the flour until it is evenly distributed in pea size pieces. For the flakiest crust: pour the flour mixture into a gallon ziptop bag and add in the butter. Push all of the air out of the bag and seal. Shake up the flour and butter until it is evenly distributed. Roll a rolling pin over the bag, flattening out the butter until it is all in very thin flakes. Return the mixture to the bowl. Alternatively: you can just add the butter to the mixing bowl and use a pastry cutter or a fork to cut it in until it is the texture of coarse meal. Press the dough together into a ball and split it in half. Wrap the dough in a piece of plastic wrap, pressing it down into a disk, and refrigerate for at least an hour or up to 3 days before using. This step is key to relaxing the gluten and allowing the dough to hydrate properly. In the meantime, prepare your filling. 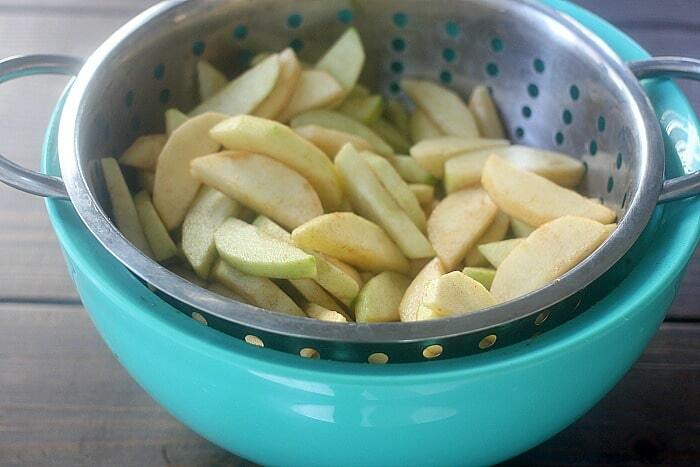 Peel, core, and slice your apples into 1/4" slices and place in a large bowl. Add the granulated sugar, brown sugar, lemon juice, cinnamon and other spices (if using), and salt to the bowl with the apples. Toss to coat. Transfer the apple mixture to a colander positioned over a bowl. Let the apples macerate and release their juices for at least 30 minutes and up to 3 hours. Pour the released juices into a saucepan. Add the butter and simmer the mixture over medium-high heat, swirling it frequently in the pan but do not stir. Reduce the mixture until it is the consistency of a thick syrup that will coat the back of a spoon. Transfer the apples back to a large bowl and toss with the cornstarch until it is well absorbed and you can no longer see traces of it. Add the reduced syrup to the bowl of apples and gently toss. The syrup may harden when it is mixed with the apples, but it will melt in the oven. Allow your pie dough to return to almost room temperature before rolling it out. You want it to be cool, but not rock hard. If your crust has only been in the refrigerator for an hour, this may only take about 10 minutes to come to temperature. If you pre-made your crust many hours or days before hand, you may need 30-60 minutes before rolling it out. Transfer the piece of dough into your pie plate and lift up on the edges to allow it to naturally fall into the plate without stretching. Roll out your second piece of pastry. Add your apple filling into the pie plate and mound the apples slightly in the middle. Cover the apples with the second piece of pastry. Trim both pieces of crust to about 1/2" wider than the pie plate. Fold the edges under, creating a lip, and pinch to seal. Crimp the crust as desired. Cut several slits in the top of the crust to vent. If desired, whisk one egg and brush it over the crust and sprinkle with granulated sugar. This will give the crust a nice golden color and add some texture to the top. Place the pie in the refrigerator to firm up for 45-60 minutes. Meanwhile, position your oven rack at the lowest level and set a sheet pan or a foil covered baking stone on it. Preheat your oven to 425F. You want the oven and the baking sheet or stone to be heating for at least 45 minutes before baking your pie. Carefully place the pie on the preheated baking sheet or baking stone and bake on the lowest position in the oven at 425 F for 70-90 minutes, rotating the pie halfway through, until the juices are bubbling and the crust is a deep golden brown. You can cover the crust with a piece of foil if it starts browning too much. Allow to cool for at least 4 hours before slicing. Regarding Apple Varieties: It is wise to use a mix of apples for a more complex flavor. See the chart above to choose the apples for your pie. My favorite combination for this pie is 3 Granny Smith, 3 Honeycrisp, and 2 McIntosh. Regarding Spices: The amount of cinnamon called for in this recipe produces a very present cinnamon flavor in the filling, but it is not overpowering. If you prefer less cinnamon flavor, you can reduce the amount. I love to add about 1/8 tsp of cardamom to my apple pie as it gives a wonderfully unique depth of flavor. However, if you want a more traditional apple pie flavor, add in 1/8 tsp each of clove, nutmeg, and allspice. I found that my apples do better too if I let them set in a bowl with the sugar while preparing the crust. The preheated surface is new to me; I’ll have to try it! thanks for all your input and knowledge, wow! Can I just skip all this and come over to your house for some apple pie? You must have made more than 1 in your search for the perfect pie. Seriously, your article (and all the linked articles) is the first one that has given me the courage to make my first pie. I will let you know how it turns out. Thanks again for a wonderful recipe and reading experience. 🙂 I’m so glad to hear this, Frank! Send me a pic of your pie at bakerbettie@gmail.com. I’d love to see it! ahhh love these tips! Some were totally new to me-like baking on a preheated surface, that’s genius! YES, me too! Such a great tip. Happy pie baking, Kayle! After reading this, I hope I can master the best apple pie before Thanksgiving. I’ll take a ton of pictures of my pie and post it on every kind of electronic media. I love a ton of cinnamon with my apples. Best of luck to you, Dennis! Send me pics at bakerbettie@gmail.com. I’d love to see your creation! I tried this today! It was my first pie ever. Definitely hit some bumps along the way but it turned out so delicious! Very excited to try this again and learn from my mistakes. Hooray! Way to go, Sarah! I’m so glad to hear this. Enjoy your pie!! The only problem was that while rolling , the dough was breaking, it felt as if I had to much shortening and butter. But the texture of Crust and apple was bang on. Thank you for sharing the techniques. Your video gave me courage to try it.